• Tower of London: With a very prominent role in the English history, this palace of her Highness is on the north bank of river Thames. This fortress has served as an armory, treasury, public office and the home of crown jewels of the U.K. This majestic stone building was built by William the conqueror 900 years ago. With so much to offer, it’s very popular among tourists. • London eye: The great Ferris wheel is a beautiful structure also situated on the banks of river Thames. This wheel has 32 air conditioned capsules in which one can view the panoramic sight up to 25 kilometers in all the directions. It is the largest observation wheel in the world! • London zoo: London zoo is considered to be the world’s oldest scientific zoo! Not only the oldest but this zoo has the history of being the first scientific zoo, first reptile house, first public aquarium, first insect house and the first children’ zoo! It is a home to as many as 767 species of mammals, insects, birds, reptiles, amphibians and invertebrates. Approximately 17519 individual animals take shelter in the London zoo! 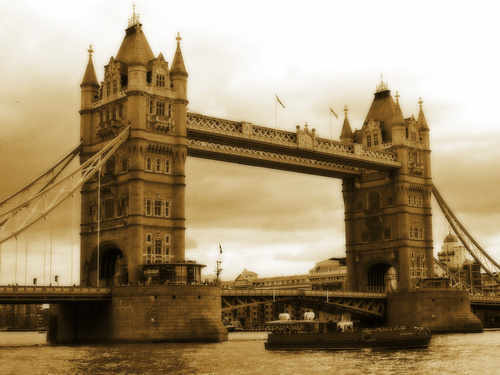 • London Bridge: The construction of the London Bridge started on 1176. It has the most intriguingly historical stories to its construction. Do not forget to visit the Tower bridge of London! Over 40,000 people cross the London Bridge daily! • Buckingham palace: Buckingham palace is both an office and residence of Queen of London. During summer, you can visit the palace and take a tour of the royally adorned 19 rooms which form the heart of the palace and also see the royal treasures and paintings! • London skyline: A fantastic idea would be to take a look at the breathtaking scene of the city by heading upwards! There are many places to enjoy the view of the buildings and attractions including hotels, London eye and also restaurants. • Madame Tussauds: This wax museum not only blends glitz and glamour with history but also has 14 interactive entertainment zones. Pose with your favorite celebrity figures, political leaders, singers and many more! Take a look at how these statues are made or just unwind in their taxi and re-live the history of England. • Parks: London is abundant in green spaces. It is a home to many parks like the Hyde Park, Kensington Park, Hamsted Park, Regent Park, St James Park, Greenwich Park, Green Park and many more! • Free attractions : London’s free attractions include The Queen house, Royal air force museum London, The Science Museum, Saatchi Gallery, Victoria and albert museum, Wallace museum, The anastheasia museum, British Dental Association Museum, Crystal Palace Park, Kenwood House, Guildhall Art Gallery and London's Roman Amphitheatre and a lot more! London, with its perfect blend of history and modernity, nightlife, cultural attractions and diverse range of people, takes place in the best-cities-to-reside-in list of the world. It is an amazing cosmopolitan city and must be surely explored in a traveler’s lifetime.